TLC Micro-Distribution cable combines high fiber counts with a compact, space saving design. 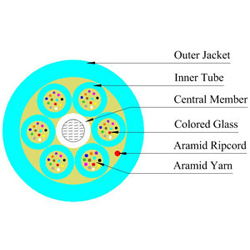 2 to 12 colored bare fibers with aramid yarn are positioned in a 3 mm jacket. 6 tubes of 12 fibers are combined to make up to 72 fibers. Each subunit is numbered for ease of installation with riser and plenum rated construction available. TLC’s Fanout Kits are a perfect match with Micro-Distribution.